a very successful combination of two people or things. 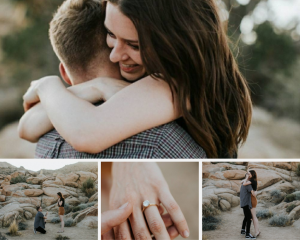 That’s how Merriam-Webster defines “a match made in heaven.” And that’s the intent behind every engagement and wedding ring we create at Love & Promise Jewelers. That’s why we’re so in love with the unique pairing of rose gold and moissanite: It’s the perfect expression of the heaven-made match you have — and the values you share — with your life partner. Moissanite is a rare natural mineral composed of silicon carbide. It was discovered in the 1890s by Nobel Prize-winning French scientist Dr. Henri Moissan, who acquired samples from an ancient meteor crater in Arizona that he at first thought were diamonds, but later determined were a rare combination of minerals (as opposed to a diamond, which is pure carbon). It took almost another hundred years for scientists to perfect the growing process of silicon carbide crystals in the lab. 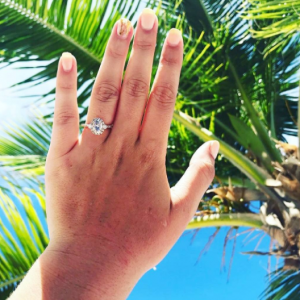 In the ensuing years, moissanites (named for Dr. Moissan) have grown in popularity as the number-one diamond alternative for socially-conscious couples. Yes, they’re for real! We bust five popular myths about lab-created gemstones. Moissanites, like the ones Love & Promise carries from Charles & ColvardⓇ, have all the clarity, color, and breathtaking beauty of a diamond. Moissanite’s durability also is near to a diamond’s (ranking 9.25-9.5 on the Mohs scale, harder than a sapphire, compared to the diamond’s 10), meaning that it will stand up to the daily rigors of life on your finger. You may also be surprised to learn that moissanite is more brilliant than any other gemstone, ranging from 2.65-2.69 on the Brilliance Refractive Index scale (compared to the diamond’s 2.3). Moreover, its fire, or dispersion (that is, the colors of the rainbow that emanate from within a finely cut gem) is far greater than any other popular gemstone. Because of its scarcity in nature, all moissanites available on the market have been created in a lab, which gives it the distinct advantage of being 100% conflict-free—meaning no blood was shed or human suffering endured in their origins. And isn’t that the story you want the precious symbol of your love to have? Learn more about conflict-free gemstones. Among the most stunning pairings of gemstones and metals is the marriage of rose gold and moissanite. 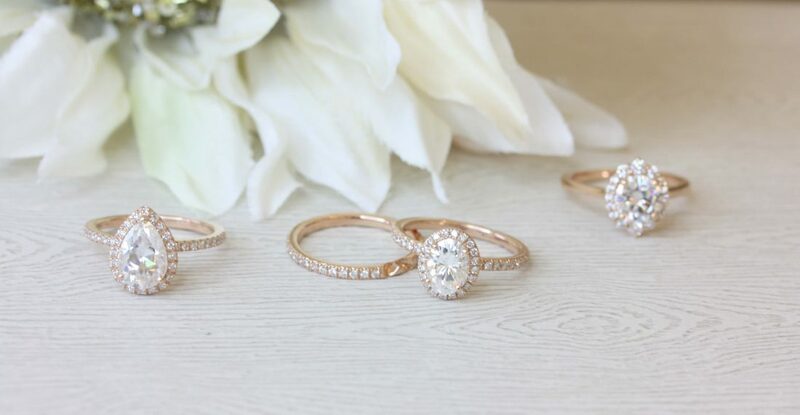 Rose gold is an alloy of gold that contains a certain percentage of copper, which gives the metal a warm, feminine, blushing hue that is flattering on all skin tones and partners perfectly with moissanite. Check out this stunner, the “Toni,” from our exclusive Rosados Box rose gold moissanite engagement rings line on our Instagram page. And the “Bridgette,” as worn by a real-life bride to be. Moissanite is typically colorless but can also exhibit hues of yellow and green. Color is created in the lab with heat treatments, just like other precious gemstones, and does not necessarily affect the value of the stone. As for the bang for your buck? Moissanite is a more affordable gemstone than a diamond and can allow you many more creative options that reflect your unique style and taste, and the story of your love. Browse our Rosados Box collection of rose gold and moissanite engagement rings by clicking the link below!